Officials with Tanger Outlets announced plans for a project near downtown Nashville. 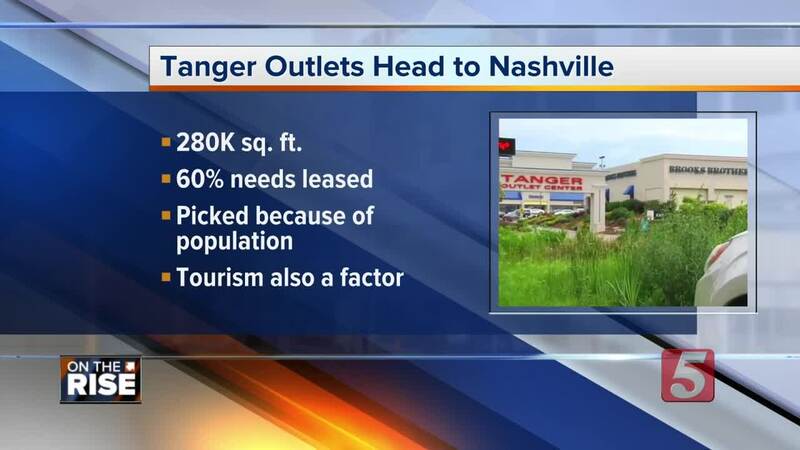 NASHVILLE, Tenn. (WTVF) — Officials with Tanger Outlets announced plans for a project near downtown Nashville. In a press release reporting the company's fourth quarter and year end results, officials say the future project would be located near downtown. Even though the exact location was not released, it was described as having direct highway visibility and adjacent to a new full interchange currently under construction. They also said it is within a mixed-use development that will be home to multiple large businesses and residential communities. The release said the company will not break ground until at least 60 percent of the project is leased. They explained that Nashville was selected based on the fact that it's "home to approximately 1.9 million people and represents one of the top growth markets in the country. It is also a popular tourist destination. Over 14.5 million travelers visited Nashville for business and leisure in 2017 which is nearly a 70 percent increase from 10 years prior."